Bornean bay cats are rare and elusive creatures. How elusive? So elusive that the sighting of one makes the news. A group of researchers from the Sarawak Forestry Department has just spotted a specimen of the endangered species in the remote Lundu area of Sarawak. And they managed to take a picture of the animal to prove it. 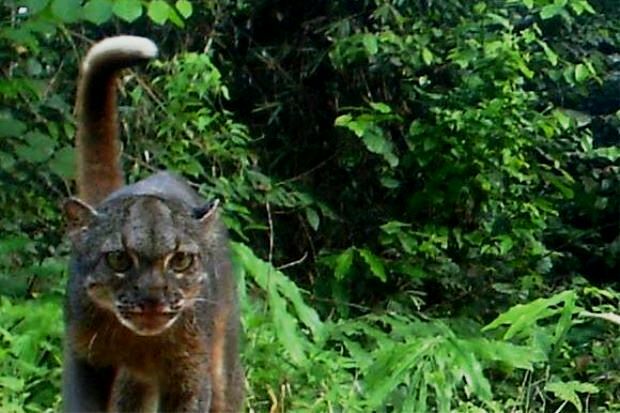 Department director Sapuan Ahmad said the latest sighting of the wild cat indicated that the secretive animals, which are indigenous to Borneo, may remain scattered around the island’s forests, most likely concentrated in their interiors. Bay cats have previously been spotted in the Mulu National Park, the Lanjak Entimau Wildlife Sanctuary, the Pulong Tau National Park and the forest of Anap Muput as well. There are only an estimated 2,500 of them left in the wild. In 2013, hidden motion-trigger cameras captured images of another specimen in a heavily logged area of the Lanjak Entimau wildlife sanctuary. That sighting, albeit made only by camera traps, also made global headlines as it had been the first time for an entire decade since the wild cats were photographed in the wild. In fact, sightings of the cats are so rare that soon after that previous sighting in 2003 the species was classified as extinct in the Bornean wild until further blurry photographs of the felines managed to be taken of individual bay cats. Bornean bay cats (Catopuma badia) are the size of larger domestic cats and sport grey or chestnut-colored fur with a long and tapering tail. Largely nocturnal like most cats, they inhabit dense tropical forests but they have also been spotted in relatively low-density habitats and even logged areas. Wherever they may be, they are extremely adept at blending unseen into their surroundings. Little is known about their habits in the wild. Malaysian Borneo’s forests also contain four other wild feline species: the Sunda clouded leopard (Neofelis diardi), leopard cat (Prionailurus bengalensis), flat-headed cat (Prionailurus planiceps) and marbled cat (Pardofelis marmorata). Four of the five feline species are listed as endangered. They are all increasingly threatened by deforestation since Borneo has one of the highest rates of deforestation in the world. In the mid-1980s, three-quarters of the island was still covered in forests; today only around a half of it is. Logging and human settlements have both encroached on natural habitats, while the illegal wildlife trade has also taken its toll on resident species, felines among them.